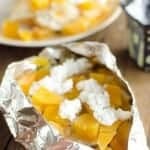 Butternut Squash & Chicken Foil Packets are an easy and healthy fall dinner you can make ahead to throw on the grill or pop in your oven. Cute 8 12" long piece of tinfoil and place two together in 4 sets of two. Spray the top of each set of foils with non-stick cooking spray and top with 1/4 of the squash, onion, sage and garlic. On top of that, lay one chicken breast and sprinkle with salt, pepper and paprika. Fold the foil packets up securely and place on a baking pan. Bake at 350° for 20-25 minutes, or until the chicken is no longer pink in the center. Allow the packets to rest for 5-10 minutes and serve by slicing them down the center and topping them with 1 Tbsp. goat cheese.